New Jersey has enacted strict rules and regulations about what medical assistants can and cannot do, and the state encourages students to obtain a formal education and certification before seeking a job. This is good news for New Jersey medical assistants, because those regulations protect them and the patients they serve. Whether students opt to work in the front office or back office, they can expect to learn the skills to handle both in an accredited medical assisting program. 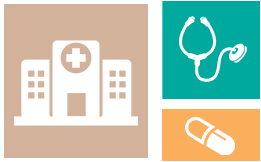 Read on to learn more about medical assistant employment trends, salaries and certification requirements in New Jersey. Medical assisting is a growing field, and the number of programs available is also growing. Earning a degree in the field allows graduates the ability to work directly with patients, affecting their quality of care in a positive way and helping physicians. But it’s important to find a program that meets your professional needs—whether you plan to go on to further education or not. 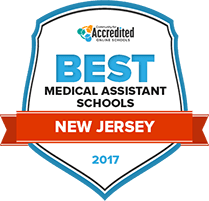 Our list of the Top Colleges for Medical Assisting in New Jersey in 2017 is your first step. We researched which schools have the most program options and services as well as tuition costs and class sizes and ranked the results to compile this list. Raritan Valley Community College's medical assisting certificate program is a 36 credit program. The last semester of the three semester curriculum consist of a practicum. During the practicum, students gain technical and administrative skills. The unpaid practicum is completed at an approved medical facility. Among the courses that students take during class are administrative medical assistant principles, human biology and medical terminology. Classes are taught on campus and online. In addition to passing a background check, students must complete and pass the American Heart Association's basic life support certification training. Within the medical assisting certificate program at Ocean County College are 80 hours of laboratory work. Total hours needed to graduate with the certificate are about 330. All students must pass a background investigation. Before they start classes, students must also obtain a stethoscope, scrubs and get student liability insurance. Medical terminology, basic clinical procedures, laboratory procedures and medical billing are types of classes that students need to gain a firm grasp on to graduate. Related programs at the New Jersey based college include medical billing professional certificate, medical coding professional certificate and medical office specialist. The medical assisting program at Washington, New Jersey's Warren County Community College is a non-credit certificate program. Length of the training is 760 hours. Students accepted into the program must be at least 18 years old and meet the requirements of a personal interview. They also must pass a background investigation and a pre-admission exam. Successfully completing classes like pathology, anatomy, clinical assisting, computerized office procedures and coding managed care prepares students to sit for the American Association of Medical Assistants certification exam. Classroom courses are capped off with a supervised externship in an outpatient facility. Curriculum and graduation requirements for the Associate of Applied Science in Medical Assisting at Hudson County Community College are managed within the college's allied health department. After declaring the medical assisting major, students can start to learn about technical and soft skill functions in the medical assistant field like anatomy and physiology, dynamics of health care in society, clinical office procedures and medical transcription. The externship at the end of the program is worth four credits. Physician offices and clinics are types of healthcare facilities where externships are completed. As many as 200 hours are built into the externship. How does New Jersey define medical assisting? New Jersey has stringent policies governing medical assistants. The New Jersey Office of Career and Technical Education defines medical assistants as "individuals, under the supervision of physicians, to provide medical office administrative services and perform clinical duties including patient intake and care, routine diagnostic and recording procedures, pre-examination and examination assistance, and the administration of medications and first aid." Are medical assistants in New Jersey required to be certified? Though some can begin their medical assisting career without certification, obtaining certification may be necessary in order to participate in some of the tasks that medical assistants would normally do. For instance, only a certified medical assistant can perform injections. Due to this, medical assistants in New Jersey would be well advised to seek certification. Is New Jersey certification available? Certification is available through national certifying agencies. New Jersey recognizes all certifications that are acceptable to the State Board of Medical Examiners, including, but not limited, to Certified Medical Assistant (CMA) and Certified Clinical Medical Assistant (CCMA). Is formal medical assistant training required? Since certification is strongly suggested, aspiring medical assistants should consider completing the requirements to obtain that certification. That means that formal education or training is required. This education can be earned through several schools in New Jersey. Are there tasks outside the scope of medical assistants in New Jersey? Medical assistants in New Jersey might be pleased to learn that median wages for the profession are higher than the national average. A breakdown on this information is included below. Where someone works in New Jersey has a strong impact on how much money they might make. When it comes to geographical location, the rule of thumb is that those who live in or near large metropolitan areas make more; however, that is not always the case. For a look at how geographical region affects medical assisting salaries in New Jersey, see the chart below. New Jersey expects to add about 600 new jobs each year for medical assistants from 2012 to 2022, a growth rate of over 21 percent. A breakdown on employment trends is included below. New Jersey is home to several accredited medical assisting schools offering various levels of education. For an idea of what's available, take a look at this spotlight school. After completing the medical assisting program, students are prepared to take the Certified Medical Assistant exam. A portion of the students' general education credits may be transferred to a four-year institution if another degree is desired. The medical assisting associate degree consists of 63 credits. In addition to receiving an associate's degree, students will also receive a certificate in medical assisting. This statute sets forth the requirements for those who want to work as teachers of medical assistant programs in New Jersey; this also has information on medical assistants. The New Jersey Society of Medical Assistants is a professional organization and affiliate of the AAMA which aims to help promote the interests of New Jersey medical assistants and improve the care provided by medical assistants. This is the administrative code regarding injection-related tasks that may be performed by certified medical assistants in New Jersey.